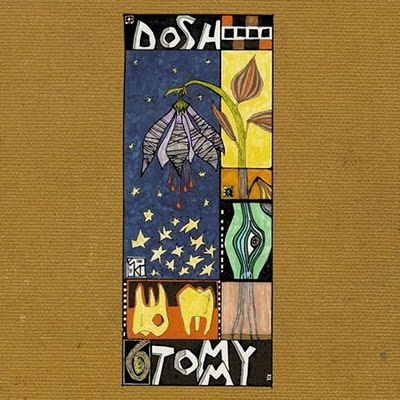 Tapes on the Floor: Album Review: Dosh "Tommy"
Tommy is Dosh's fifth studio album, a tribute to Martin Dosh's former soundman, the late Tom Cesario. As such, one might expect the record to be a rather somber affair, rife with the kind of melancholy that so often accompanies the passing of a loved one. Instead, Dosh chooses to celebrate Cesario's life with his usual arsenal of upbeat, loop-driven arrangements. The result is an album that combines the many disparate elements of Dosh's more recent work into a fitting tribute for a fallen friend. Opening track "Subtractions" sounds like it could have come straight off of 2006's The Lost Take, characterized by its bouncing synth and saxophone embellishments care of Happy Apple's Mike Lewis. It's a highly enjoyable showpiece of a song, taking just about every trick up Dosh's sleeve and combining them into a track that sounds both familiar and fresh. "Number 41" marks the first appearance of Andrew Bird on the record, providing his usual brand of carefully measured vocals over Dosh's dense instrumentation. Bird's last record was missing the sort of full-on collaboration with Dosh that Armchair Apocrypha's "Simple X" hinted at, so his appearance on this record is definitely a welcome occurrence. Rounding out the A-side of the record is a track called "Airlift"; one of the more grandiose and cinematic compositions ever to grace a Dosh album. With its swelling strings and organs, it's a sound we haven't heard from Dosh in the past, but one that provides another of Tommy's many highlights. Tommy's 'Be-side' commences with a retread of sorts, finding Dosh reworking "Call The Kettle" which previously appeared on the Powder Horn EP. Here the track is expanded upon, building slowly until climaxing in the familiar riff that has made this particular song a staple of Dosh's live performances. Andrew Bird make another appearance on "Nevermet", a dusty acoustic ballad that provides the perfect backdrop for Bird's nuanced vocals. Closing track "Gare de Lyon" starts out innocently enough, with a snippet of dialogue setting off a simple drum beat which slowly builds into a laid-back groove. As the song progresses, it begins to sound more frantic before dissolving into a wave of feedback that is joined by another vocal recording. The final two minutes are best described as raw sonic emotion; an outpouring of the kind of joy and sorrow best communicated through music. It's a fitting finale to an album that takes so much pleasure in the subtleties of sound. On Tommy, Dosh continues to solidify himself as one of the most unique forces in modern music. While his songs have always been deeply personal, this record manages to plunge into even greater emotional depths. Dosh found his voice through his music long ago; with Tommy he's shown that he has something to say.